This document describes how to edit basic details of an AEFIS survey template, including title and description fields. You must be an AEFIS administrator in order to edit survey templates. Survey templates must be in Draft format in order to edit these fields. After a survey template is Published, you will have to create a new survey template in order to make edits. 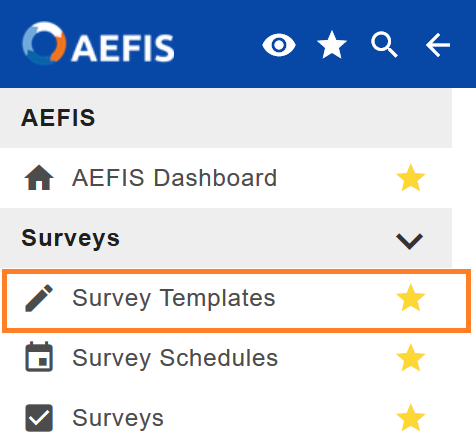 See AEFIS - Creating a Survey Template (Admin). Select Survey Templates under Surveys. Navigate to the template you want to edit. Confirm that the survey template is in Draft status and select Manage. You will be brought to the Survey Template Manager page. Select Details from the left menu bar. On the Survey Template Settings page, you will be able to edit the title, description, instructions, and thank you text of your draft survey template. Template Name: Edit this field to update the title of the survey. This name is only seen by you, the admin. Students and instructors see the Survey Schedule name. Survey Type: You cannot edit this field. If you selected the wrong survey type when setting up your survey template, you will have to create a new template. See AEFIS - Creating a Survey Template (Admin). Instructions: Instructions will display on the survey form and will be visible to students and other survey participants. Thank You Text: This text will display to students and other survey participants after the survey is completed. Use the blue Save button at the bottom of the page to save your changes.